This makes for a good mini salad in a multi-course meal, or try it over crostini for an appetizer you can make ahead and keep in the fridge waiting for the moment to strike. It also just has a lot of yummy tips for how to best bring out the flavor in peppers, and the dressing is a fantastic addition to your repertoire. This recipe is from one of my favorite books: Vegetarian Cooking for Everyone (by Deborah Madison, which my family lovingly refers to as the family potluck bible. If you’re interested in canning those peppers from the market and save Summer for the coming Winter, check out this old time method. Grill and peel a selection of different-colored bell peppers (directions below), allowing 1/2 pepper per person. Be sure to reserve any juices that collect in the bowl while they’re steaming. Slice the peppers into halves or quarters, scrape out the seeds, and layer the peppers on a platter. Make Saffron Vinaigrette with Basil (see recipe below), adding any reserved pepper juices. Toss the peppers with vinaigrette to moisten and serve garnished with sprigs of basil and Nicoise olives. Place whole peppers directly on a gas burner (on your stovetop) or on the grill. Roast the peppers until the skin becomes wrinkled and loose, turning them frequently with a pair of tongs. If you want the peppers to be soft and slightly smoky, roast them until the skins are completely charred. Set the peppers in a bowl, put a plate on top, and let them steam at least 15 minutes to loosen the skins. If you wish to grill bell peppers without peeling them, slice off the top of the tip of the pepper, open it up, and remove the veins and seeds. Brush with olive oil and grill, skin side facing the fire, until the skins are puckery and lightly marked but not charred. Turn the grill on the second side for a few minutes, then remove and season with salt and pepper. Leave the peppers in large pieces or cut them into strips as desired. Skinny peppers and chiles can be brushed with oil, grilled whole until just blistered, then sprinkled with salt. For a saffron lover, this dressing will become a favorite. Use it with summer vegetables- roasted peppers and potatoes, grilled zucchini, tomato salads, grilled fennel. Or add finely diced tomatoes to the dressing and spoon it over grilled or roasted eggplants. In a bowl, combine 3 tablespoons fresh lemon juice, 2 teaspoons snipped chives, 1/2 teaspoon grated or minced orange zest, 1/4 teaspoon of salt, and a few grinds of pepper. Warm 2 tablespoons of oil right over the heat in a small measuring cup, crumble in a pinch of saffron threads and let stand for a few minutes. 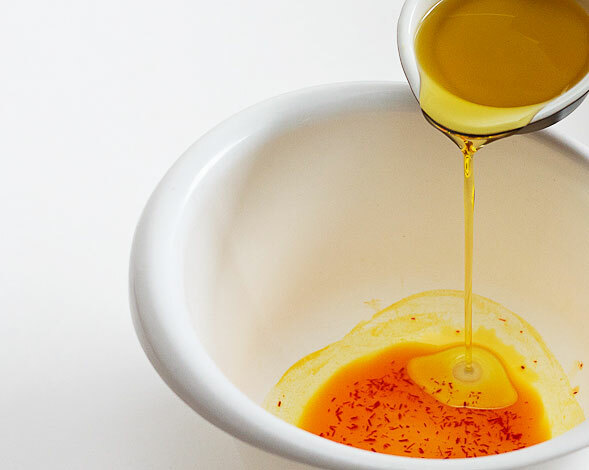 Add this oil to the dressing and whisk in 6 more tablespoons of olive oil, Add 2 tablespoons of snipped or torn basil leaves just before using. Makes about 1/2 cup of dressing.